And the winner...out of the massive amounts of people who commented (people....comment....I see that 146 people read the post in 1.5 days...I know you're out there) is ....Stephanie! I will contact you and have your Big Big prize sent directly to you! Keep your eyes out for more contests. Or you will miss out. You never know, I may start to give out cars and trips to Australia too. Now....as I mentioned....the big O....OPRAH!!!! 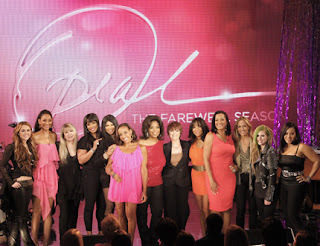 This past Friday I had the great joy of attending one of the final episodes of the Oprah Winfrey show. It was an incredible joy and a total dream come true. The show was entitled, "Rock Goddesses of the '70s and '80s" and featured Pat Benetar, Stevie Nicks, Joan Jett and Sister Sledge. They were paired with rock goddesses of today which included Miley Cirus, Avril Levigne and Sheryl Crow. Not bad, eh? I loved seeing the behind the scenes stuff, like Oprah bitching about her horribly uncomfortable shoes, and Miley forgetting the words to her song, and I loved just being in the presence of Oprah. Incredible. What amazed me were the rediculous questions that audience members asked her. I mean honestly, you have 20 seconds to ask Oprah Winfrey a question, and you ask her, "What was the first concert you ever attended?" Or tell her about your group of friends that are attending the show with you...seriously people. Say something unique, or thought provoking. Or just sit in your chair with your mouth gaping open at her amazingness like me. That works too. Truly an incredible trip. I was sad that my sister could not attend the show with us as we only had two seats. I tried to convince the girl ahead of me to give us her extra seat as her mom could not attend at the last minute. I had coached her in the line and told her to say: "So my mom is very, very ill and couldn't come with me today, so I brought my friend Robyn(my sister) with me as my support system to see the show as I am so upset about my mother". Instead...she walks up and says..."So this girl here wants me to change my extra ticket into her sister's name. I've never met them before, they were just standing behind me in line." Not so much what we had discussed. She would make a bad salesperson. And thus, she didn't get in. I tried. So watch Oprah today at 4:00pm! It will be a great show! Well really you should always watch Oprah, every day, because it rocks. My sister tried SO hard to get me that extra ticket. I just wish we had been able to see Kara and my mom in the audience. Silly Oprah focusing on the rock legends instead of Kara and my mom.